No trip to Singapore is ever complete until you visit one (or all) of the country's ethnic enclaves. Imagine the full cultural scope of Asia, compressed into a handful of districts scattered throughout Singapore – that sums up the experience of visiting the ethnic districts that serve the Malay, Chinese, and Indian communities that call Singapore home. Apart from the cultural high, you'll also get your fill and more of shopping and dining at every ethnic stop! Chinatown was born out of Sir Stamford Raffles' policy of allocating a district to each ethnicity in Singapore – his 1828 town plan allocated the area south of the Singapore River to the island's immigrant Chinese, who built Chinatown's narrow streets and shophouses. Kreta Ayer is the first part of Chinatown visitors see, as the Chinatown MRT stop exits right into Pagoda Street in this neighborhood. The pedestrianized lanes in Kreta Ayer are lined with shops selling traditional and modern goods, camera stores, and hawker food. Smith Street is the site of the Chinatown Food Street. The Chinatown Food Street and Night Market is a must-see for visitors who want to sample the district's take on traditional Chinese food. On Sago Street, you can find the Buddha Tooth Relic Temple, another major religious destination for Singapore's Chinese Buddhist community. Telok Ayer and Ann Siang Hill combined make up one of Chinatown's oldest areas, the former filled with temples dating back to the 19th century, the latter a rapidly gentrifying neighborhood filled with hip watering holes and coffee shops. Visit the oldest Taoist temple in Singapore, Thian Hock Keng Temple, to get a look at the religious activities of the old-time Chinese residents of Singapore. The Singapore National Parks Board suggests you take this walking tour of Ann Siang Hill and Telok Ayer Green to get a grasp of the local culture. Shopping in Chinatown. As the exponent of Chinese culture in Singapore, Chinatown uses its historical buildings to sell the ethnic cultural experience to the hilt: its renovated shophouses shelter shops for traditional Chinese arts and crafts, clothes, food, jewelry, and traditional medicine. Where to stay. For budget accommodations in the area, look through this list of Singapore Chinatown Budget Hotels. Eating in Chinatown can be an adventure – all you need is the courage to enter a Singaporean hawker stall and try whatever you don't recognize. (Start with these ten dishes you should try in Singapore). Singapore hawker centers like Maxwell Road Food Centre and Chinatown Complex have everything to get you started, whether you're a rank newbie or a fearless gourmand. 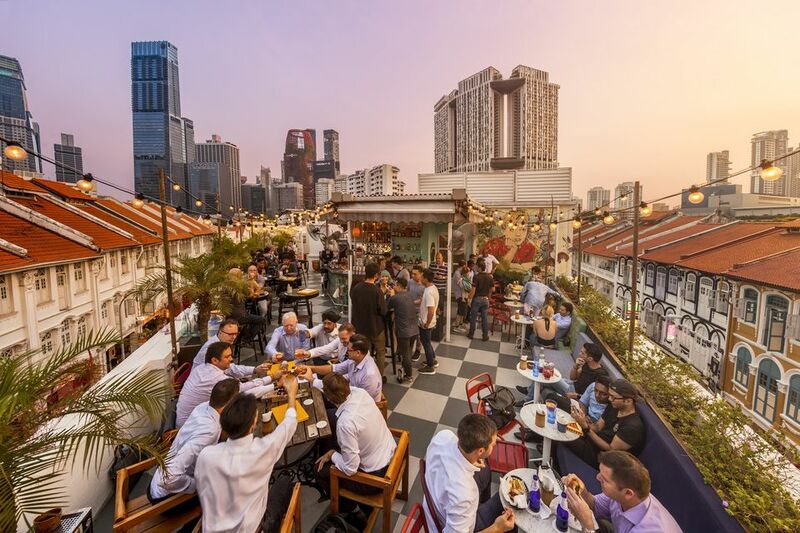 You can also try streetside dining out on Pagoda, Temple, Serangoon, and Smith Streets – Smith Street in particular is the site of "Chinatown Food Street", the country's first al-fresco street dining venue within a heritage district. For the best time to visit Chinatown, schedule your trip to coincide with Chinese New Year in Singapore and Hungry Ghost Festival; the former for streetside bazaars and roadside stalls selling lucky foods, lamps, and souvenirs; the latter for street performances of Chinese Opera for the benefit of ghosts roaming the earth. The Islamic DNA of Kampong Glam should be immediately apparent to the first-time visitor. The Sultan Mosque and its massive gold dome casts a long shadow over the neighborhood. The street names bear a distinct Arab influence, being named after famous cities in the Middle East (Kandahar in Afghanistan, Muscat in Oman, Bussorah – Basra – in Iraq), and the shops reflect the varied Muslim cultures who have made this part of Singapore their home. Kampong Glam's old buildings betray its history as the former home to Singapore's old Malay royalty. The former Istana, or royal palace, now houses the Malay Heritage Center and its eight galleries showcasing the history and culture of Singapore's Malays. The Sultan Mosque, found at the corner of Arab Street and North Bridge Road, is Singapore's largest mosque. The Sultan Mosque was built in the 1920s, and its golden dome is hard to miss. The shopping scene on Kampong Glam is a goldmine for Asian culture lovers – Persian carpets, silks, batiks, brassware, oil-based perfumes, costume jewelry, and Malay hats can all be bought along the bazaar-style shops on Arab Street, North Bridge Road, Kandahar Street, and Muscat Street. Haji Lane and Bali Lane, two parallel streets at the southwest end of Kampong Glam, provide a totally different retail scene – one that's younger, more hip and more vibrant than anything else that Singapore has to offer. Centuries of Arabic, Indian, Malay and Indonesian immigration have made Kampong Glam's food scene what it is today – a spicy smorgasbord of Muslim-friendly fare that ranges from teh tarik (pulled tea) to Turkish coffee to mutton biryani to murtabak. Where to stay. The westernmost corner of Kampong Glam is occupied by the Golden Landmark Shopping Center and a hotel rising out of it, the Village Hotel Bugis, a business-class hotel with a swimming pool. Some of the shophouses in Kampong Glam make ideal haunts for boutique hotels and hostels. When to visit. Kampong Glam really comes alive during Ramadan, as outdoor food stalls and bazaars crop up to feed hungry Malays after sundown. Singapore's Katong neighborhood – of which Joo Chiat is its most famous street – was long known as the heartland for the nation's Peranakan community. The Peranakan (also known as Straits Chinese) represent a fusion of Malay and Chinese culture that lives on in Katong's vintage architecture. In recent years, Joo Chiat has escaped the rapid modernization that has accompanied Singapore's march into the 21st century, with over 900 shophouses and buildings preserved by local conservation laws. The trade in these shophouses caters more to locals than to tourists, although some degree of gentrification has taken hold. Bubble-tea shops and boutique bakeries coexist alongside dry goods stores, traditional Chinese medicine halls and Malay clothes shops. Some of the shophouses have been creatively repurposed into budget hotels and hostels; tourists staying here can wade in neck-deep into the local culture, at a cost of staying at a remove from Singapore's more popular attractions. Koon Seng Road and East Coast Road still have an assortment of shophouses and terrace houses with a uniquely Peranakan flair. History buffs can explore Katong's Peranakan past in greater detail through museums like the Katong Antique House and boutiques like Rumah Bebe. The Katong area is also well-known for its great ethnic food, mostly concentrated along East Coast Road's hawker stalls. Little India has the most unique aroma of all of Singapore's ethnic enclaves - chalk it up to the spices and scents sold and used through its many streets. Little India is home to the 24-hour mall known as Mustafa Centre, where retail literally never sleeps. Other souvenir shopping stops include the Little India Arcade, Tekka Market, and the stalls over on Campbell Lane, where traditional saris can be fitted and bought. Visit Little India during the traditional festivals of Deepavali and Thaipusam to see Little India at its best – lit up by thousands of lights and bustling with even more activity than usual. How to Join in Singapore's National Sport: Shopping!